About The Battle. Once the fighting in the Civil War began, there were several critical junctures at which a different turn of events might have affected the outcome. Those critical points are discussed on the turning point page of the site. The most famous of those turning points is Gettysburg. More than a million visitors flock to the park each year. A lengthy reenactment of the entire battle occurred when the film "Gettysburg" was created. The film was based on perhaps the most famous novel about the Civil War, Michael Shaara's "the Killer Angels." Even during the three days of the battle itself, a shift in tactics or strategies might have affected the outcome, and with that, perhaps, the outcome of the war. The Battle of Gettysburg occurred more or less by accident. Neither General Lee nor General Meade, who took command of the Union Army of the Potomac only days before the battle, planned to fight on the edge of a sleepy little college town in Pennsylvania. Lee's victory at Chancellorsville was the springboard for his second invasion of the North; Lee was planning to move deeper into the north, perhaps capturing Gettysburg or even threatening Philadelphia. His string of successes, interrupted only by Antietam, might have ended the war in favor of the South had he been successful. Between the battles of Chancellorsville and Gettysburg, however, a far less well-known battle took place at Brandy Station, where Union and Confederate cavalry fought each other to a standstill. That fact alone is worth noting, for up to that point in the war Confederate cavalry had often literally ridden rings around the Union armies. That fact alone is worth noting, for up to that point in the war Confederate cavalry had often literally ridden rings around the Union armies. But under the capable Union cavalry commander, General Alfred Pleasonton, Jeb Stuart met his match, which must have been difficult for the flamboyant “Last Cavalier” to accept. When General Lee gave General Stuart what might have seemed ambiguous orders prior to the start of the invasion of the Pennsylvania, General Stuart was apparently in a mood to redeem n himself. He took off on an extended ride through Maryland, skirting the city of Washington, and moved along what is now the Rockville Pike towards Pennsylvania. In the course of his foray he captured a Union supply train. His cavalry troopers eventually caught up with Lee's army, but by then the battle at Gettysburg had been going on for two days. Ever since Stuart had departed days earlier, Lee had been without his eyes and ears. Union cavalry, however, in the capable hands of General John Buford, was reconnoitering southern Pennsylvania in advance of the Union Army, which was making its way along the Baltimore Turnpike in the general direction of where Lee was believed to be. A division of A.P. Hill's Corps under the command of Henry Heth discovered the town of Gettysburg, and for reasons never completely explained (they were supposed to have been looking for shoes), his men began to advance toward the village of 4,000 inhabitants, which nevertheless happened to be the center of a number of major roadways and the site of a railroad under construction. Seeing Heth’s advancing troops, Buford decided to take them under attack. Meanwhile, knowing that he was heavily outnumbered, Buford sent a messenger back to General John Reynolds, commander of the 1st Corps of the Army of the Potomac> He told Reynolds that he had was engaged with a major portion of the Confederate Army and that Reynolds's corps should head towards Gettysburg without delay. 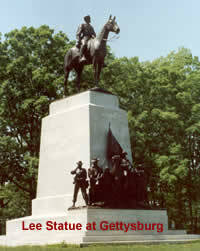 Neither General Lee nor General Meade was present when the fighting began on the first day at Gettysburg. Lee was drawn to the action by the sounds of fire from Heth's division and quickly sent officers forward to determine what was going on. Not having contemplated a full engagement while his army was still divided, Lee nevertheless realized the he was too heavily engaged to break off the action, so he urged his remaining divisions forward. The two corps under Reynolds and Heth clashed on the northwestern outskirts of Gettysburg, while General Richard Ewell, now commanding Stonewall Jackson's old corps, was summoned from his advanced towards Harrisburg to join the action at Gettysburg. The arrival of Union General Oliver O. Howard’s 11th Corps helped to shift the balance toward the Union, which for much of the first day of fighting was outnumbered. The Union men were driven back through the town of Gettysburg and onto some high ground to the south and east of the town—Culp’s Hill and Cemetery Ridge. That's where the fighting ended the first day. Lee established himself on Seminary Ridge, a strip of high ground backed by woods on the southwest side of the town of Gettysburg. General Ewell’s corps was deployed around the northeast side of Gettysburg facing Culp's Hill Part of A.P. Hill's 2nd Corps was arrayed along the northernmost segment of Seminary Ridge, and that component of Longstreet's Corps which was already on the battlefield was south of Hill's men. At least for the time being Lee seemed to have the upper hand. It is worth mentioning here that there were seven corps in the Union Army, only three in Lee's army. The corps in Lee's Army of Northern Virginia, however, were larger than those in the Army of the Potomac. Meade commanded about 100,000 soldiers, Lee about 75,000. General Meade arrived late in the evening of the first day of fighting and called his officers together in to assess the situation. With parts of his army and supplies advancing along the Baltimore Pike from the southeast, Meade understood that defending his position on Culp's Hill was crucial. By the next morning General Slocum's XII Corps was entrenched on Culp's Hill, with Howard's XI Corps on his left flank and Winfield Scott Hancock's II Corps extending to the South along Cemetery Ridge. On Hancock's left Flank was Daniel Sickles III Corps. Having been successful with a double envelopment at Chancellorsville by attacking the Union army on both flanks simultaneously, Lee decided to attack Meade's army in a similar manner. But Gettysburg was a different place, and leadership in the Union army had been shaken up in the month since that last battle, and perhaps more important, Stonewall Jackson was no longer Lee’s top lieutenant, having been killed at Chancellorsville. Lee's instructions to General Ewell were to take Culp’s Hill “if practicable,” the sort of command Jackson would have taken as leaving no room for doubt. Ewell threatened the Culp's Hill position several times, coming within yards of the Union supply train, but he never broke through. On the south end of the battlefield, General Longstreet was directed by Lee to advance on the left flank of the Union line on the southern portion of Cemetery Ridge. A crucial piece of ground, Little Round Top, was unoccupied for most of the day, and Longstreet felt that a move around to the rear of the Union line behind Round Top and Little Round Top would be more effective. Lee wanted a direct attack, and Longstreet followed Lee's orders. The details of the fighting on the second day are readily available from multiple sources and won't be covered here. Suffice it to say that neither Ewell nor Longstreet accomplished what General Lee had in mind. Most critically for the outcome of the battle, Union officer Brigadier General Warren discovered that Little Round Top was uncovered and quickly dispatched Union troops to that high ground to protect it. The famous 20th Maine held off attacks from three Alabama regiments, and at the end of the day the Union line stretched from Culp's hill to Little Round Top, with its seven corps arrayed the famous fishhook formation. The three Corps of Lee's army were arrayed from the northwest facing Culp’s Hill to the South along Seminary Ridge facing the Union line across a mile or so of open ground. Thus the stage was set for the third and decisive day of the costliest battle ever fought in North America. Perhaps realizing that to that juncture he had committed much and gained little, and that not only his Army of Northern Virginia, but the remaining southern forces were beginning to run out of resources, Lee decided to gamble on one great, bold stroke. He would attack directly into the center of the Union line, using George Pickett's fresh division, which had not been engaged in the second day, supported by additional troops from Ewell's corps. General Meade, a thoughtful if not brilliant general, concluded that Lee, having tried the flanks unsuccessfully, would probably attack the center of his line. He was correct in his assessment. Shortly after noon on July 3rd General Lee's artillery opened up a furious barrage designed to weaken the Union defenses along Cemetery Ridge. Thus began the greatest artillery duel ever conducted in the Western Hemisphere. It is reported that as the wind shifted during the afternoon, the rumbling of the cannon could be heard as far away as both Pittsburgh and Philadelphia. Whether that is true or not, the smoke, fire and noise that erupted were never forgotten by the troops present that day, not to mention the citizens of the town. Because of the smoke raised, it was difficult for the Confederate gunners to determine the effectiveness of their artillery fire upon the enemy. Thus Lee's artillerymen were unaware that much of their shot was passing over the Union lines and landing in the rear, where it did considerable damage to supplies and other rear echelon elements, but had little impact on the troops who were preparing to defend against the assault. When the smoke finally cleared General Pickett's division, some 15,000 strong, marched out of the woods to the music of regimental bands, with bayonets glistening, and arrayed themselves in an impressive line stretching along the front edge of Seminary Ridge. Union troops on Cemetery Hill were awed by the spectacle, but, still smarting from Fredericksburg and Chancellorsville, they were not intimidated. Union artillery had been held in reserve in anticipation of the infantry advance, leading the Confederates to believe erroneously that it had been seriously impaired. The gunners stocked their batteries with canister shot and moved them forward into position to defend against the infantry charge. There was no more major fighting in eastern sector in 1863. The destiny of the South was still being played out at Vicksburg, Mississippi. The Battle of Gettysburg was the largest and most famous battle of the American Civil War. Those three days in July, 1863, marked the last time that Lee's army advanced onto northern soil. When a few hundred of Lee's men broke through the Union lines on Cemetery Ridge during Pickett's charge, that was seen as the high water mark of the Confederacy. Lincoln's visit to Gettysburg in November 1863 and his delivery of his famous Gettysburg address enhanced the position of the battle and American lore, as did the fact that President and Mrs. Eisenhower retired to a farm in Gettysburg not far from the battlefield. Whether Gettysburg was the most important battle of the Civil War is debatable; the Battle of Vicksburg, which was concluded on July 4, 1863, the day after the last day of Gettysburg, secured the Mississippi River for the Union and cut the entire western portion of the Confederacy off from further involvement. It was the first major step in what came to be known as Winfield Scott's often derided “Anaconda Plan” to surround, divide and crush the Confederacy. The final leg of that plan was completed when Sherman marched through Georgia in 1864. 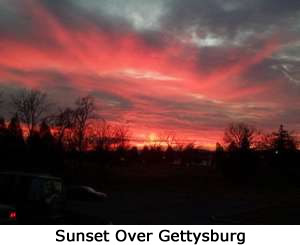 But Gettysburg, located just over an hour's drive from the nation's capital and quite accessible from the great cities of Baltimore, Philadelphia, and New York, has received far more attention and a great deal more tourist traffic than the city in central Mississippi. And Gettysburg was unquestionably vitally important to the cause of both sides. It might well be claimed and that what did not happen in Gettysburg was as important as what did. And the figure who was conspicuously absent during the Battle of Gettysburg, General Thomas J. Stonewall Jackson, who was killed at Chancellorsville a month earlier, must be considered as crucial missing piece for General Lee, given the way that the battle was conducted. In addition, the fact that the Confederates did not win at Gettysburg was far more critical than might be concluded from the fact that even after two the Union victories at Gettysburg and Vicksburg, the war dragged on for two more years. Some historians have claimed that that fact made the Battle of Gettysburg less than and determinative; while one can only speculate what might have happened had the Confederacy defeated a Union in Gettysburg, it is not hard to imagine that the entire outcome of the war would have been different for a variety of reasons. Gettysburg has been the subject of a huge volume of literature, a fine movie based upon the fictional work, The killer Angels, and endless articles and debates in various Civil War publications. Entire books have been written about the performance of single regiments at Gettysburg, and a book about the second day by Harry Pfanz runs to 600 pages. Troops of Boy Scouts, and students at military schools of all levels tramp the battlefields at Gettysburg every year, sometimes covering the entire ground on foot for three days. Bus loads of tourists invade the Gettysburg national military Park annually, and Gettysburg College hosts regular academic conferences dealing with the Civil War in general and Gettysburg in particular. Visiting the battlefields in the town of Gettysburg today, although the historic parts are well protected and preserved, nevertheless gives one the impression of “Gettysburg: the Industry.” That's not all bad, however, for the school children and tourists who leave their dollars in the various souvenir shops take with them books, pamphlets maps and mementos that may indeed enrich their understanding of that crucial era of an American history. To get the full measure of the battle, a visit to Gettysburg is desirable, though not indispensable. For an addition to the fine film, Gettysburg, numerous documentaries of the battle have been produced and are widely available. The Ken Burns television series on the Civil War naturally included major segments in Gettysburg as well. To gain more insight into the battle, one needs merely to search "Gettysburg" on the web in order to find many links. The battle is also discussed in the 1863 page linked below.